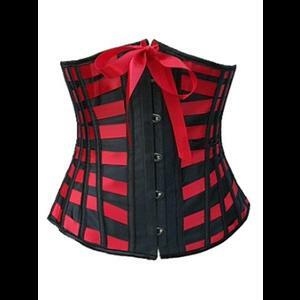 A stunning underbust corset made from black satin with red satin horizontal striped ribbon. 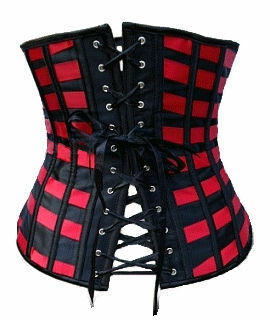 The corset has two flat steel bones either side of the front busk fastening with a further 14 bones throughout and red satin ties at the front. The back has metal eyelet and adjustable ribbon lacing. If you wish to achieve the waist reduction shown on the model, you should choose a size 4" smaller than your natural waist size. 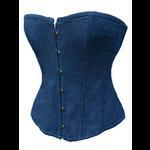 Underbust: 28" Waist: 25" Length: 10"
Underbust: 30" Waist: 27" Length: 20"
Underbust: 32" Waist: 29" Length: 20"
Underbust: 34" Waist: 31" Length: 20"
Underbust: 36" Waist: 33" Length: 20"